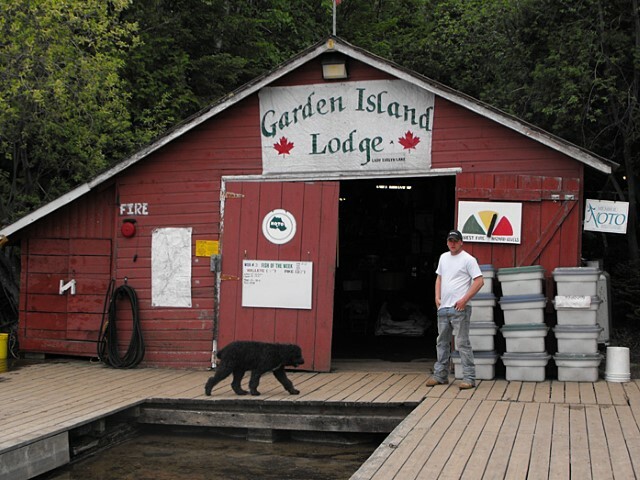 Located on a 13-acre island at the western end of Lady Evelyn Lake. 9 private cabins sleeping between 2 and 6 people (larger groups are given adjacent cabins), with fridge, propane heat, ceiling fan, coffee maker (with coffee, decaffeinated coffee, hot chocolate, tea, etc. ), 24 hour electricity, three piece bath (sink, flush toilet, & hot shower) large deck, and each has a spectacular view of the lake. Within the Lodge, all bedding, pillows, blankets, linens are supplied, maid service is available on request. The Sauna is centrally located next to the Lodge. 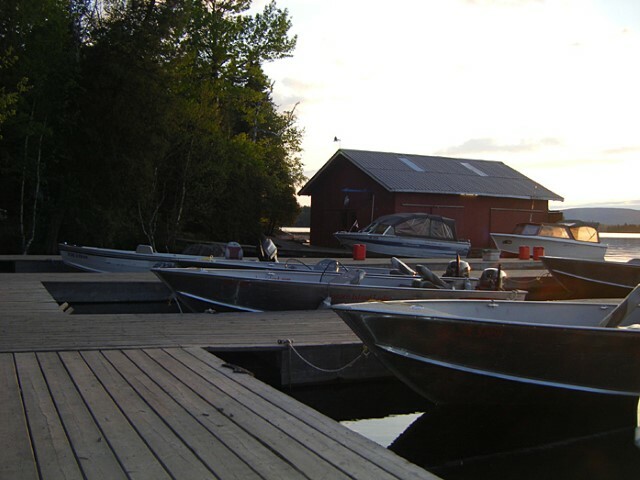 The cabins are 75 to 100 feet apart to give privacy to each party, yet each cabin has over look the lake. Our private dining room is contained in the air conditioned main Lodge building and is open only to our guests. Our breakfast menu includes among other things, pancakes and sausages, scrambled eggs and ham, bacon and eggs, toast and jam, omelettes made to order, etc. while our dinners include lasagna with garlic bread and salad, roast turkey with all the trimmings, roast pork and apple sauce, crispy chicken and rice, roast beef with Yorkshire pudding, shepherds pie, and many other favorites. We pack a shore lunch for you take out on the lake daily. The meals served in our climate controlled Lodge are superb, are prepared on-site, and are all you can eat. Our chef also offers special dietary meals for those that request them, at no additional charge at this Lodge. The boats and motors provided at Garden Island Lodge are some of the finest offered anywhere. Our 25 horse power electric start motors are all Yamaha 4-stroke models. The Lund 16.5 foot deep ‘V’ boats are exceedingly comfortable with high backed swivel pedestal seats (with lumbar support), raised flat floor, casting deck, illuminated automatic live well, storage compartments, bilge pump, Eagle fish finder with temperature read out, running lights, all required safety equipment, anchor, landing nets & catch and release cradles, life jackets, and each is equipped with a complete ‘camp kitchen’ for those delicious shore lunches. 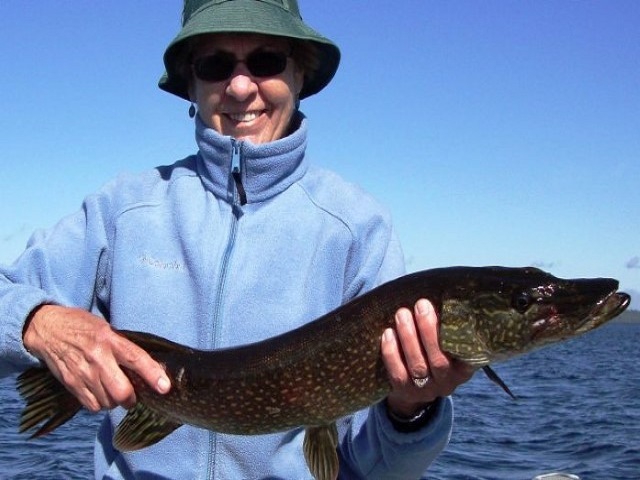 The trophy fishing for walleye, northern pike, and the small-mouth bass is nothing short of amazing. 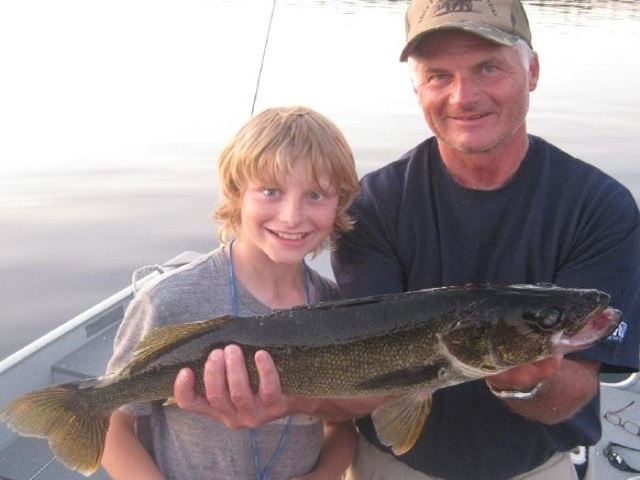 Each year our guests at this Northern Ontario Fishing Lodge catch a huge number of walleye over 24″ with current record being 36 inches – 18 1/2 pounds.